Next Article: Want to know what startup event is your community's favourite? 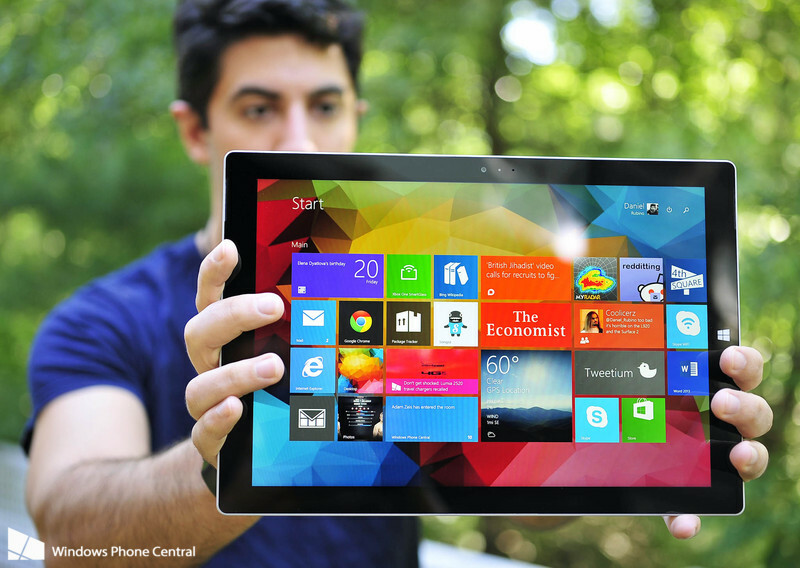 Jeffrey Yuwono reviews the Surface Pro 3 in this edition of Weekly Cornerplay. Two weeks are up -- did he keep or return Microsoft's device? I used to work in management consulting. We’d travel overseas on Mondays, do work at the client site over the week and return on Fridays. Rinse, repeat, month after month. It was hard to maintain friendships back home this way, and when you’re alone in a foreign city, there isn’t much else to do but work. Work consisted of three things: White boarding to brainstorm and debate; Excel spreadsheets, which sometimes got so large and complex we had to turn off the automatic updating of cells; and huge PowerPoint files that could be the client’s three-year strategic plan. To do that, we lugged a 15-inch laptop everywhere we went. I don’t know how heavy my bag weighed with the laptop, power adaptor and all the printed files we’d invariably need, but it was like a ton of bricks. Consider how much walking we did at airports, hotels and offices — it was gruelling. This is a long lead-in for a Surface Pro 3 (SP3) review, but you can see where this is going. For someone working in that kind of job, an SP3 would have been a godsend. It would have changed the quality of my life in a meaningful way, and that is why I always believed in Microsoft’s vision for the Surface. Instead of a ton of bricks, I would have carried a svelte 1.2 kilograms for the tablet, keyboard and pen. Instead of two, there’d be eight hours of battery life. I’d still have the power of Office — not just the program but all its shortcuts too — along with my macros, VPN and so on. Instead of brainstorming on a white board and copying it down to keep a record, we could have just used OneNote and the SP3 pen. Back in the hotel, instead of being upright against a desk to use a rigid laptop, I could have curled up in bed to browse the web, Skype with my girlfriend and watch movies on a tablet. Movies look gorgeous on the SP3’s 1440P and 3:2 display. DisplayMate, a research company specialising in rating screens, ranked the SP3’s display as second best overall for tablets; just behind the Samsung Galaxy Tab S 10 and ahead of the iPad Air. The 3:2 ratio is a revelation, especially for web browsing. In landscape mode, you can see so much more content. The fully adjustable kickstand is another revelation. Previously, typing on a Surface meant finding a flat surface. With the kickstand, there are many more positions where you can actually do real work; positions not practical with a traditional laptop even. My new favourite is sitting in bed, knees bent with the SP3 draped over them. Another favourite is having the kickstand fully extended so the tablet lies at an angle on a flat surface. It’s perfect for reading and for diagramming with the pen. While I found the 12-inch, 800 gram SP3 a bit unwieldy as a tablet — it could lose a hundred gram or two — the kickstand helps. There weren’t many instances where I preferred to hold the tablet versus letting the kickstand do its work. For tablet usage, where the SP3 is disadvantaged in terms of size, it makes up for it with the adjustable kickstand. 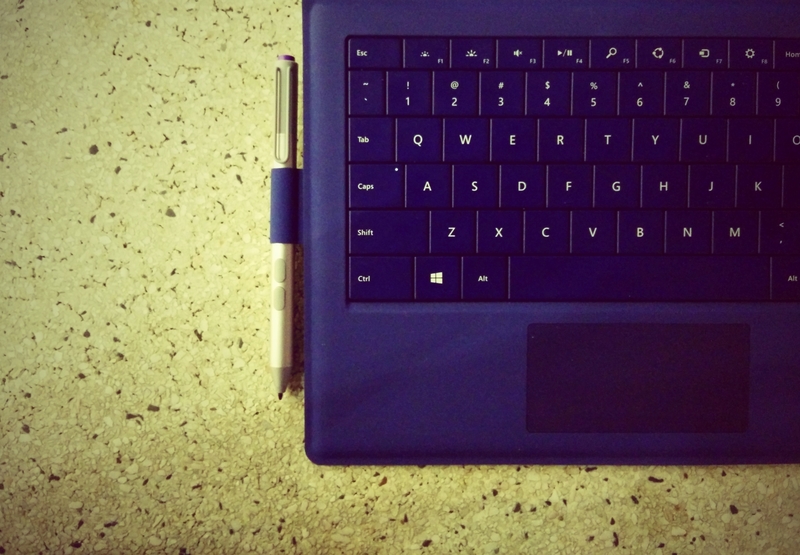 What I love most about the SP3 is the pen. It’s the tablet’s killer feature, especially for people who like to think, brainstorm and create. 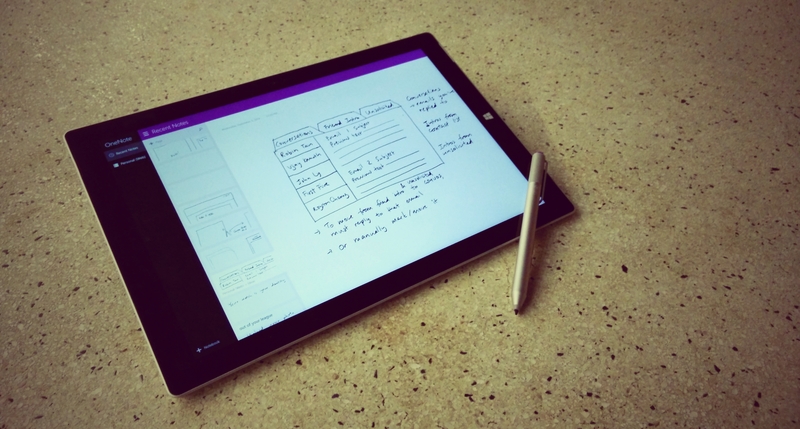 I’ve used OneNote and the pen to sketch out ideas, plan long documents, jot notes and more. It’s too bad there’s so little awareness about its capabilities. The SP3 pen is based on N-trig instead of Wacom. I like the switch: deleting with a button is more efficient than flipping the pen around and it doesn’t go wonky at the screen’s edge like a Wacom pen does. The only downside is there’s no good place to store it; Microsoft provides a pen loop that’s functional but not excellent. This is a minor quibble though. The Type Cover — purchased separately — is a must-buy. Not only because it protects the tablet’s screen, but also because it doubles as a keyboard. I’ve always liked the Type Cover and write just fine with it. The trackpad is greatly improved; it was barely usable before and now it’s on par with most laptops. I love that the keyboard attaches to the screen via an additional magnet and can’t imagine not having it. 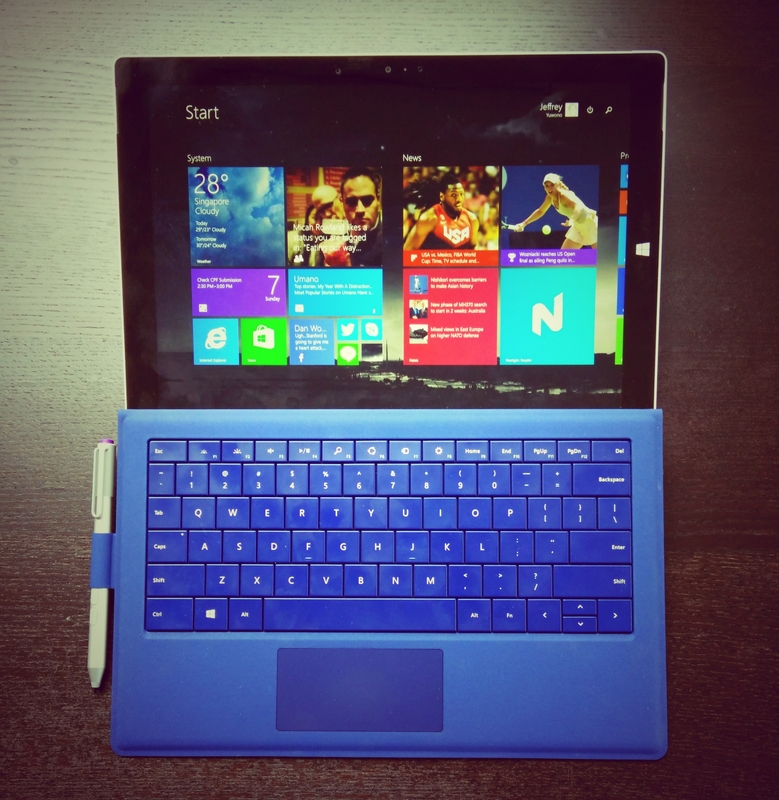 You might think this review is an unequivocal recommendation for the SP3, but you’d be wrong. At one point I was close to returning it. Setting up the SP3 was smooth and easy. Windows 8.1 synced all my details without any hitches. The SP3 was often hot and the fan blew continuously but I chalked that up to a one-time set-up process of downloading updates, apps and files, etc. The nice thing about 256 GB of storage is that I can locally sync my entire cloud drive to it. Unfortunately, the hot temperatures and fan blowing continued even after a week. The tablet got so hot that holding it became uncomfortable. Is there any greater failure than a tablet that’s too uncomfortable to hold? 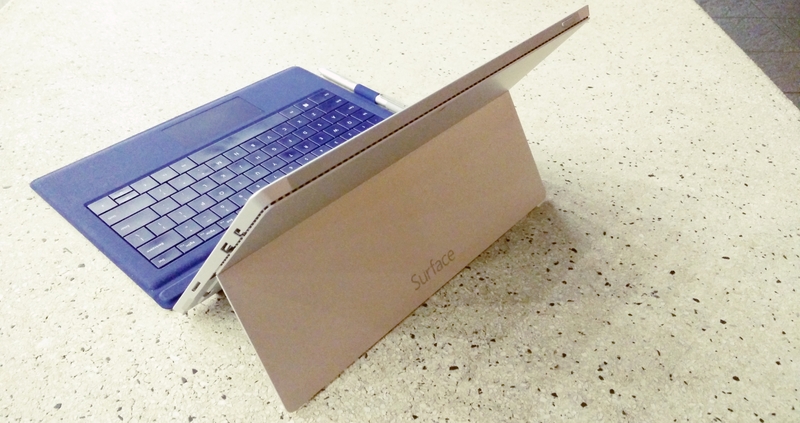 The SP3’s value proposition would have been literally cut in half. Not only that, battery life was poor. In continuous use — with programs like Office, OneNote, Internet Explorer and Spotify on 35 per cent screen brightness — the SP3 lasted an average five to six hours compared to the nine hours that Microsoft advertised. Given the SP3’s competition and its price point, six hours of battery life is unacceptable. I came close to returning the SP3 because of these two issues. 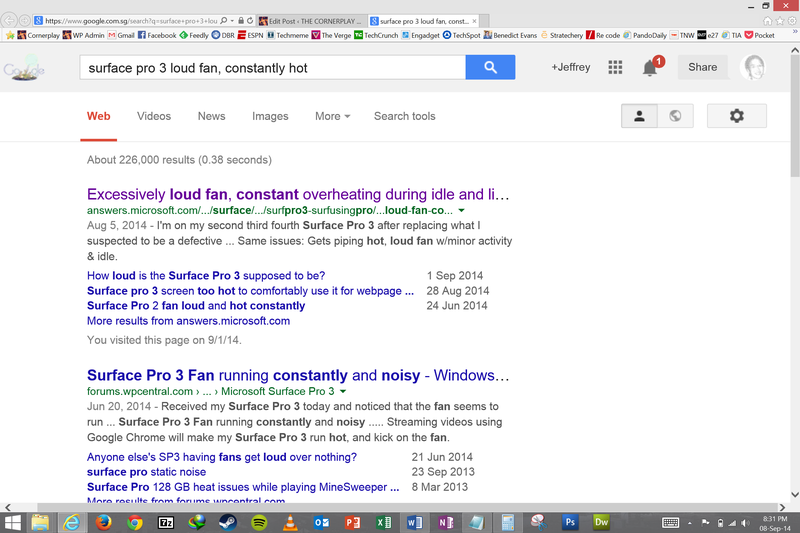 I didn’t give up on the SP3, and after extensive research found the cause of these two problems. Essentially, the SP3 was excessively slow in indexing files, a process required for instant search. My five year old desktop PC would index a file in seconds while the SP3 needed 45 minutes to index the same file. 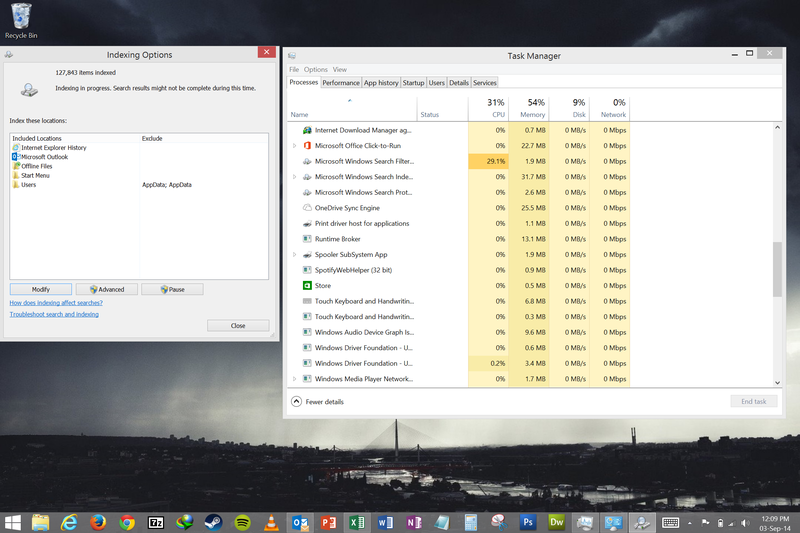 While the SP3 struggled to build a search index — which was all the time — it continuously used 30% CPU. This explained why the tablet was constantly hot and why battery life was so poor; every time you added a new file, the SP3 would restart this labourious indexing process. It turns out the SP3 was missing a file from Adobe that caused it to get stuck if PDFs were included in the index — hardly the most exotic of file types. Downloading this missing file (you can do it here) completely solved my slow indexing problem. Today, my SP3 is only infrequently hot and the fan hardly ever comes on. With this bug squashed, in continuous use my SP3 averaged seven to eight hours. I believe eight hours is a significant threshold — a computer should be able to last the entire working day — and the SP3 just about gets there. While the fix is simple enough, it calls into question why Microsoft does not seem aware of it, as you can tell from its support forums. Did Microsoft employees not dog food the product? Did nobody question the tablet’s hot temperature and bad battery life? Is it possible that no Microsoft employee had PDFs that needed indexing? This is made more unbelievable by the fact that the SP3 launched two months ago in the United States. Many actual customers have complained online since – yet Microsoft remains clueless. Some online posters are on their fourth SP3, thinking there was something defective with their unit! I only found the solution because a blogger cared enough to systematically and extensively test to diagnose the problem; and because I cared enough to Google — I mean Bing the answer. But it is Microsoft who should have done all this. The SP3’s other drawbacks are mostly software. It’s still flaky. It doesn’t happen often, but the WiFi connection would randomly drop; the keyboard would stop responding; the screen could get weird; the SP3 would wake from sleep while in my bag and run hot. It’s nothing that switching “on and off” wouldn’t solve, and nothing I hadn’t already experienced with previous Surfaces. That these issues still exist does say something, however. Yet, these are all livable flaws. 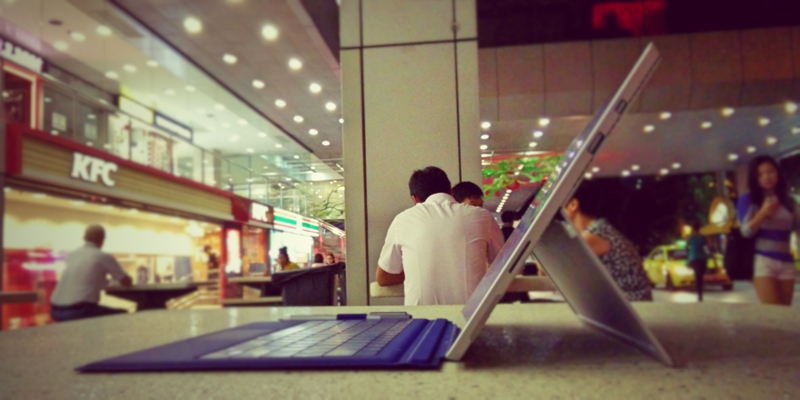 The SP3’s flexible form factor, power, pen and beautiful display more than make up for it. Now that the overheating issues are under control, there’s only one major obstacle that prevents the SP3 from being a mainstream recommendation: Price. The Core i5 with 8 GB of RAM that I purchased (with the Type Cover) costs US$1430 in the US and S$1911 in Singapore. This is fair value considering the hardware. Nevertheless, at this price you have to carefully consider whether you truly need such a device. The inevitability of a Surface Pro 4 next year — with a Broadwell chip that will eliminate the fan, extend battery life and keep performance high, all in a lighter and thinner form factor — is something you have to live with. You will notice that I haven’t said anything about performance. Unsurprisingly, that’s because with a Core i5 chip and 8 GB of RAM, the SP3 screams. However, I don’t really need all that power. I was able to get work done years ago with a much weaker laptop, and can probably get by with that today. If the Core i3 version came with more than 64 GB of storage, I would have definitely gotten that instead. I would love to see Microsoft release a Surface 3 with an Atom chip in the same form factor, with an N-trig pen and at least 4 GB of RAM and 128 GB of storage. Charge US$700 and I would have easily preferred that over the Core i5 equivalent at US$1000. It was a close call, but I’ve decided to keep the SP3. Now that my dream product is a reality — albeit with flaws — I don’t want to go back. The author, Jeffrey Yuwono, blogs at the The Cornerplay, a blog about tech, gadgets and entrepreneurship. The views expressed here are of the author, and e27 may not necessarily subscribe to them.